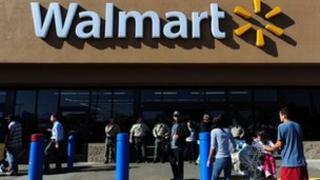 The US says global retail giant Walmart has not violated any laws lobbying US lawmakers to facilitate its entry into India. The firm has disclosed that it spent $25m (£16m) on lobbying, including on issues related to "enhanced market access for investment in India". Opposition MPs in India are demanding a probe into the disclosure. Last week, MPs voted to open the retail sector to foreign competition - an issue that has proved highly divisive. Lobbying is said be conventionally illegal in India, though there are no laws that say so. Correspondents say opposition MPs are assuming that Indian lawmakers had been "bribed" by Wallmart lobbyists in a symptom of how charged the debate over foreign retail has become in the country. "On the US side, I don't have any reason to believe that we have a violation of US law here. With regard to the Indian side, I'll refer you to them," State Department spokesperson Victoria Nuland was quoted as saying by the Press Trust of India news agency. "The report which some of these allegations have cited is a regularly required report for the US government as part of our open government transparency in governance requirements," Ms Nuland added. Walmart echoed her comments, saying in a statement that its disclosure was required by US law. "The expenditures are a compilation of expenses associated with US federal lobbying contacts and include staffing cost, association dues and payments made to consultants, all in the US." The decision by India's government to allow 51% foreign direct investment (FDI) was approved by the Lok Sabha (lower house) on 5 December and the Rajya Sabha (upper house) on 7 December. Opposition parties, led by the Bharatiya Janata Party (BJP), oppose the government's decision. The move has also been strongly opposed by tens of thousands of small businesses and corner shops who fear they would be put out of business. But the government and business leaders argue that it will boost the economy and transform the way Indians shop.